This delicious yeasted cake is tender and moist. It makes the perfect breakfast, snack or sweet dessert. Decorate with colorful berries or a dollop of whipped cream. 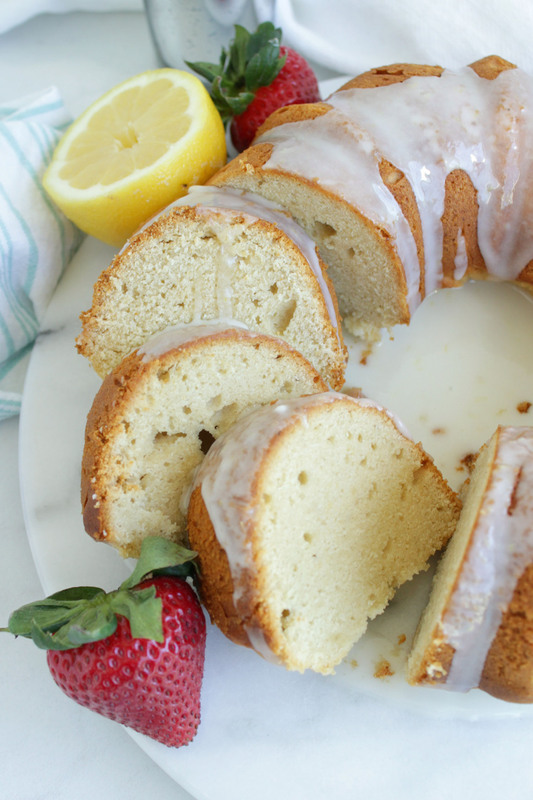 Grease standard size bundt cake pan. In microwave-safe bowl heat butter until completely melted. Stir in ½ cup milk (should be 110-115°F). Whisk in yeast. In a large mixing bowl, add sugar and butter mixture; beat until light and fluffy. Add in eggs, one at a time, mixing after each egg is added. Add in lemon juice. In a separate bowl whisk together flour, xanthan gum, and salt. Add remaining milk (at room temperature) and flour mixture (one cup at a time) to mixing bowl. Mix until just combined. Pour cake batter into prepared bundt pan. Cover and place in warm area to rise, about 30 minutes. Preheat oven to 325°F. Uncover and bake for 45-60 minutes, until golden brown and toothpick come out clean when inserted into cake. Remove from oven and let cool for 5 minutes in pan. Invert pan on cooling rack to remove cake from pan. Let cool for 1 hour. Meanwhile, whisk together powdered sugar, salt, milk and lemon juice. Add more/less milk to achieve desired thickness. Once cake is cooled, top with glaze.